This week we visited Chanute, Kansas to get some work done on our HitchHiker at the factory. One of the highlights of a visit to Chanute is the Safari Museum where the accomplishments and legacy of Martin and Osa Johnson - their films, photographs, expedition reports, correspondence and personal memorabilia - are housed at the museum. It is such an interesting place, I decided to devote this message to a summary of the accomplishments of this extraordinary and little known couple. Some of you might have heard of them, but I had no idea who they were. 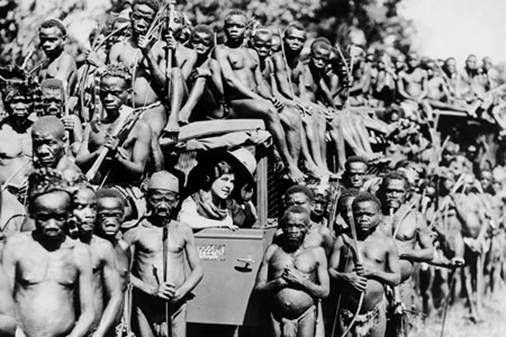 Mbuti pygmies at Bwana Sura, in the eastern Congo, pose here along with Osa for a group photograph in, on, and around her Willys Knight automobile. This entire community of Mbutis agreed to assemble their whole village outside of the dense Ituri Forest they normally called home so that the Johnsons’ cameras would have enough light to function and a film of this community going about their daily lives could be produced. In the first half of the 20th century an American couple from Kansas named Martin and Osa Johnson captured the public's imagination through their films and books of adventure in exotic, far-away lands. Photographers, explorers, naturalists and authors, Martin and Osa studied the wildlife and peoples of East and Central Africa, the South Pacific Islands and British North Borneo. They explored then unknown lands and brought back knowledge of cultures thousands of miles away through their films, writings and lectures. From 1917-1936, the Johnsons set up camp in some of the most remote areas of the world and provided an unmatched photographic record of the wildernesses of Kenya, the Congo, British North Borneo and the Solomon and New Hebrides Islands. Their equipment was the most advanced motion pictures apparatus of the day, some of it designed by Martin Johnson himself. When the young adventurers left their home in Kansas to explore and photograph these lands, little did they realize that they would provide the world with a photographic record of the African game of unimagined magnitude and beauty. The Johnsons gave the filmmakers and researchers of today an important source of ethnological and zoological material which would otherwise have been lost. You have probably seen some of their work which has been incorporated into other movies. When there is a grainy black and white, jerky segment of native peoples or wildlife it is probably from original footage shot by the Johnsons. Their photographs represent one of the great contributions to the pictorial history of the world. Their films serve to document a wilderness that has long since vanished, tribal cultures and customs that ceased to exist. For more information about the Safari Museum visit their website at http://www.safarimuseum.com/. This weekend we are visiting with daughter Lisa and her husband Marc in Denver. You’ve already met Lisa and Marc when they visited us on Tilloo back in February. Had some snow flurries today in Denver. Monday we head further north to Polson, Montana.